population of Malaysia are smaller communities scattered throughout the peninsula and in Sabah and Sarawak. Officially, these groups are classified as Lain-lain or Others. Although they are only a small minority on their own, the Lain-lain groups collectively form a sizeable portion of Malaysia's almost 21 million people. In the peninsula, orang asli, Portuguese, Eurasians and Malaysian Thais are just a few of these small communities. 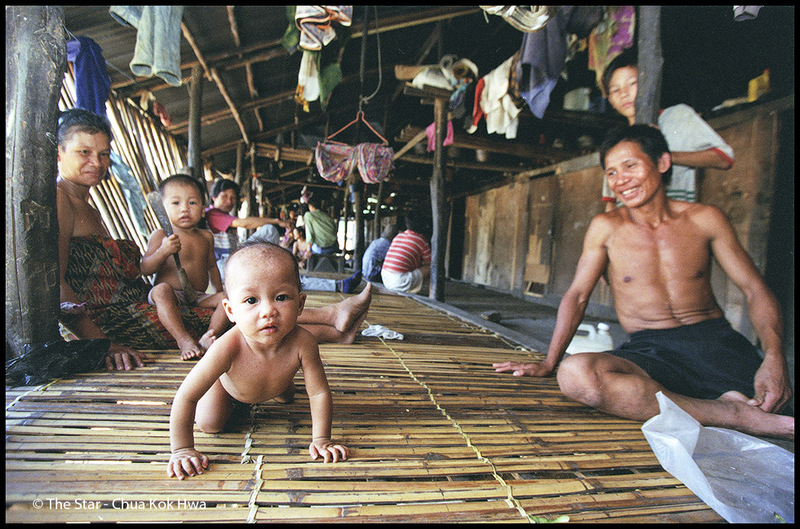 Orang asli are scattered throughout the peninsula, from the Malaysia/Thai border to Johor. Generally categorised as bumiputras, orang asli are divided into three groups - Negritos, Senois and Proto-Malays. The present population of orang asli is 92,529, according to statistics compiled by the Department of Orang Asli Affairs (JHEOA). Of this, 2,972 are Negritos, 49,440 Senois and 40,117 Proto-Malays. Up until the 1960s, most of the orang asli were jungle dwellers who foraged in the vast forests of the peninsula for their daily subsistence. Being animists, they depended on the spirits in their surroundings to keep them safe, often invoking their help in cases of illness or strife in the community. This was done mainly through a sewang (seance) session which was almost always a village-wide affair. Nowadays, with changes brought about by religion, education and the cash economy, many orang asli have given up their traditional lifestyle. Almost five centuries of European presence, starting with the Portuguese conquest of Malacca in 1511, then the Dutch and later the British, was bound to leave its mark on the social make-up of Malaysia. A prominent aspect is the presence of a sizeable community of Eurasians who are descended from inter-marriages between locals and Europeans, and also between Europeans and children of Chinese and Indian immigrants who had earlier made this country their home. Among the Eurasians, the Malaysian Portuguese stand out as a distinct group of people who are linked together by their beliefs, religious practices and language. 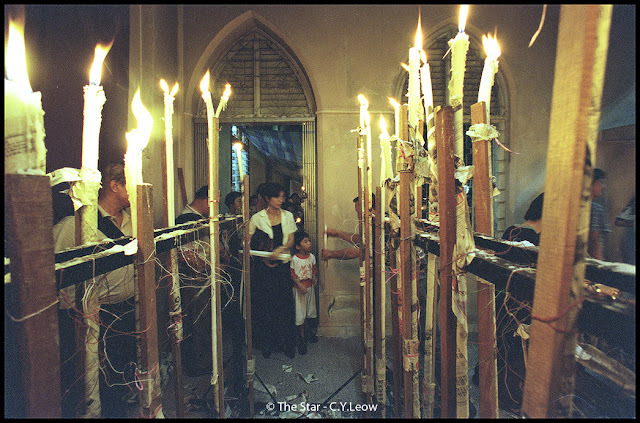 To this day, the Portuguese Settlement in Malacca remains their cultural and religious meeting point; the place where they congregate in their thousands to celebrate important festivals like Festa de San Juang and Festa De San Pedro. Festivals are usually celebrated with spirited singing and robust dancing. Up on the northern frontier, a community of Malaysian Thais makes another piece of the colourful and intricate jigsaw that is the Malaysian populace. 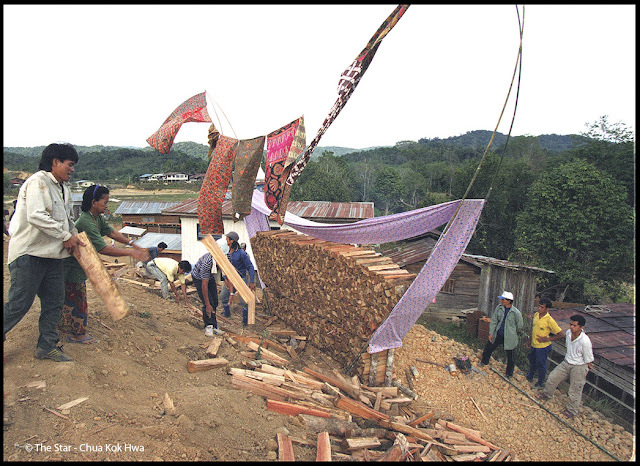 In Kedah alone, there is an estimated 26,000 Malaysian Thais residing in some 55 villages. The rest are scattered around Perlis, Perak, Kelantan, Terengganu and Penang. Members of the Malaysian Thai community are linked by their religious beliefs (most are Buddhists), the use of a common dialect called Pai Thai and a rich cultural heritage related to Thailand. Besides Pai Thai, they also speak the more conventional Bahasa Malaysia, English and Hokkien. 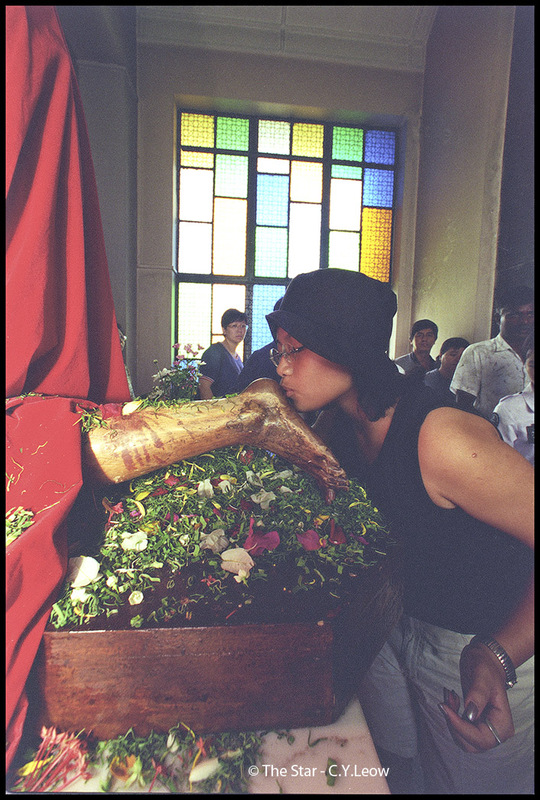 The Hokkien influence is the result of inter-racial marriages and living with Chinese people in the same village. The formation of Malaysia in 1963, when Malaya and two former British in Borneo - Sabah (then North Borneo) and Sarawak - federated together to become a new political entity, led to further enhancement in the social milieu of the entire nation. Like Malaya, Sarawak and Sabah were also a melting pot of diverse ethnic communities and immigrant groups which had coalesced after a few centuries of living together. 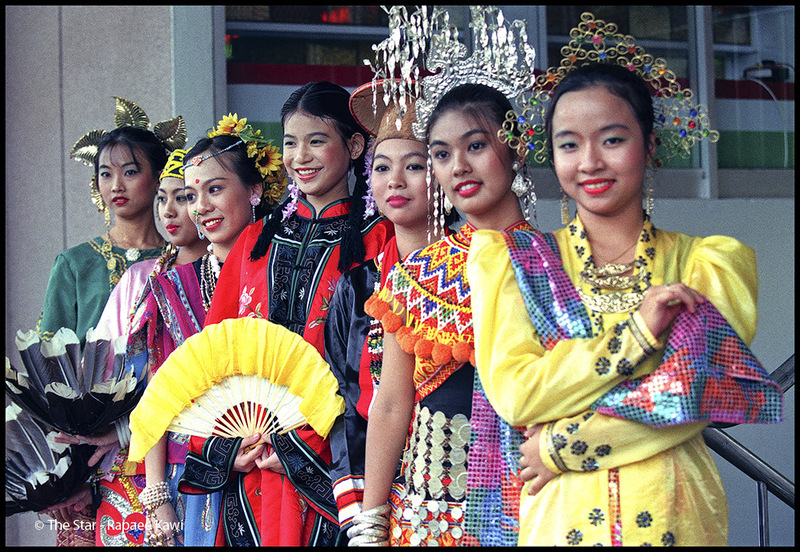 Unlike Malaya's population which could be generally classified into three distinct groups, Sabah's and Sarawak's were made up of a great diversity of linguistic, cultural and ethnic groups ranging from relatively large communities like the Kadazandusun (Sabah) and Iban (Sarawak) to small groups such as the semi-nomadic Penans (Sarawak) and the Lundayeh (Sabah). Although it covers an area 124,449 sq km in size, Sarawak is relatively underpopulated when compared to other Malaysian states like Selangor or Penang. However, its population of only 1.9 million people is a bewildering mix of 29 indigenous groups including Malays, and immigrant groups comprising the Chinese, Indians and others, mainly Eurasians and Europeans. For administrative purposes the people of Sarawak are respectively categorised as Iban, Bidaytih, Melanau, Malar, Orang Ulu, Chinese, Indian and Others. 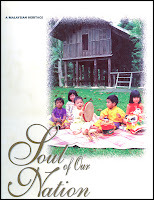 While Ibans make up the largest ethnic grouping, Melanaus are reportedly one of the earliest groups to inhabit Sarawak. 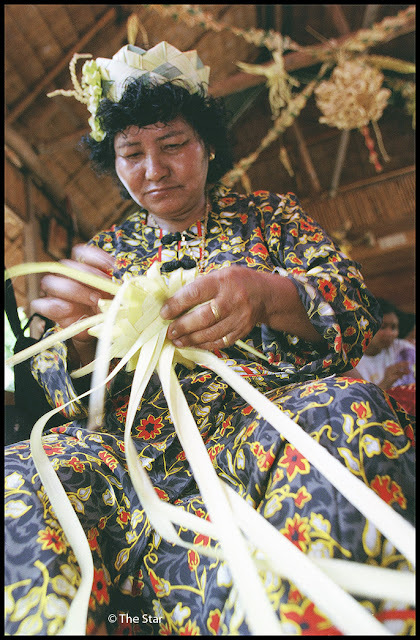 Bidayuhs are believed to be the original settlers of Kuching, the state capital and the Kayans are the largest sub-group under the Orang Ulu category. Though not a thorough representation of the people in the Land of the Hornbills, this section will attempt to provide a glimpse of life among the Iban, Bidayuh, Melanau and Kayan communities. In the Land Below the Wind, the populace is also a highly diverse composition of both indigenous and non-indigenous groups. First, there are the indigenous and mainly non-Muslim communities such as the Kadazandusun, Murut and Lundayeh. Included under this category are various sub-groups such as the Rungus, Lotud and Kwijau (Kadazandususn) and the Timogun, Tagal and Peluan (Murut). Traditionally agriculture-based, a large section of these communities have now become urbanised or live in suburban residential areas. Muslim indigenous such as the Bajau, Suluk, Illanun, Brunei and Kedayan make up the next group. In this group, the Bajaus are the most numerous and can be categorised into two groups, the west coast Bajau and east coast Bajau. Immigrant groups who settled in Sabah over the past 100 years - the Chinese, Europeans, Bugis, Filipinos, Timorese and other Indonesians - make up the rest of the population. A unique group of immigrants are the Cocos, a culturally and economically vibrant community who live in the vicinity of Tawau, Kunak and Lahad Datu on the east coast. A throwback to colonial times, the Cocos were originally inhabitants of Cocos Island in the Indian Ocean. They were accorded bumiputra status when they arrived between 1949 and 1952 in a (British) government-sponsored immigration program. Intermarriage between members of Sabah's different communities, which was popular in the passband remains so in the present, has led to a linguistic and ethnic polyglot that is hard to find anywhere else in the world. With each group in possession of distinctive cultures, traditions and customs, there are presently more than 50 languages and well over 100 dilates in use in Sabah. Taken as separate entities, the smaller communities are without doubt a minority, but each group has indelibly carved its own mark on the large Malaysian society. * Text taken from page 120 to 123 of "Soul Of Our Nation" under Other Communities. 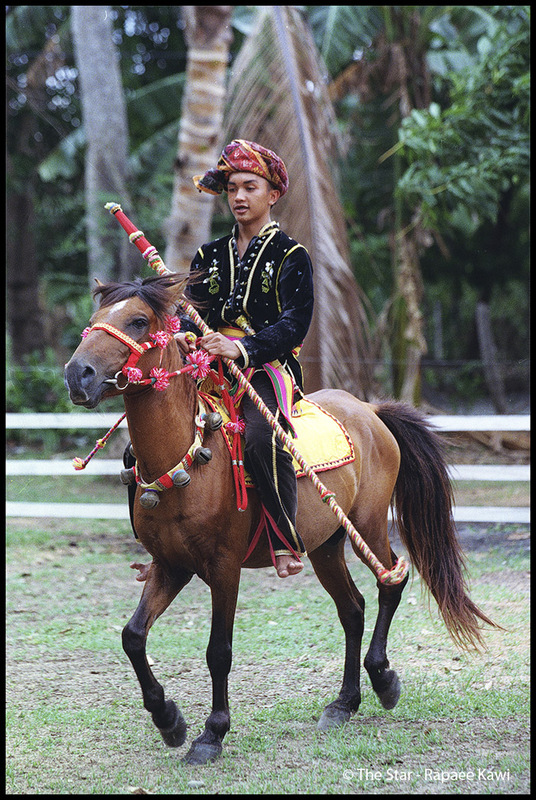 Attired in full traditional costume and astride their equally well-decorated horses, the Bajau "Cowboys of Borneo" are a spectacular sight to behold. 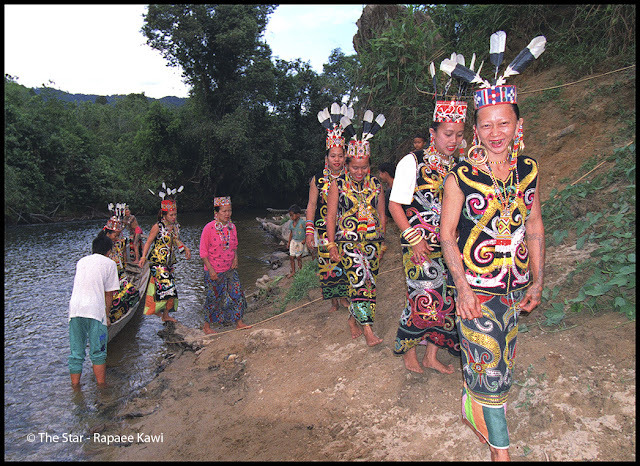 Bajaus comprise the largest Muslim indigenous group in Sabah and the population is split between the east coast and west coast. Although both share a common heritage, there are distinct differences in the lifestyle between each group. The west coast Bajaus are more land-oriented with agriculture being their main occupation. The vast plains drained by the Kedamaian Tempassuk Rivers in Kota Belud offer good agricultural land which supports a system of mixed farming and animal husbandry. For this reason, the west coast Bajau enjoy good repute as rearers of buffaloes, cattle and horses. 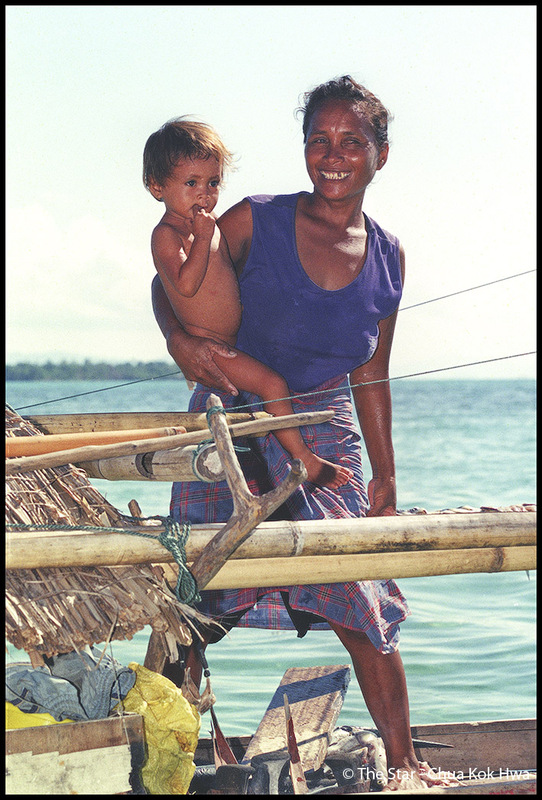 As a reflection of their sea-based lifestlye, the Bajaus of the east coast especially Semporna and its nearby islands are represented by the lepa, a traditional fishing boat. Tied to the sea. Over the past few decades, majority of Bajaus in the east coast have taken to land-based activities such as agriculture, business and formal employment in government and private sectors. Some, however,still look to the sea for their livelihood and spend most of their time on boats as they move from one place to another harvesting the riches of the sea. 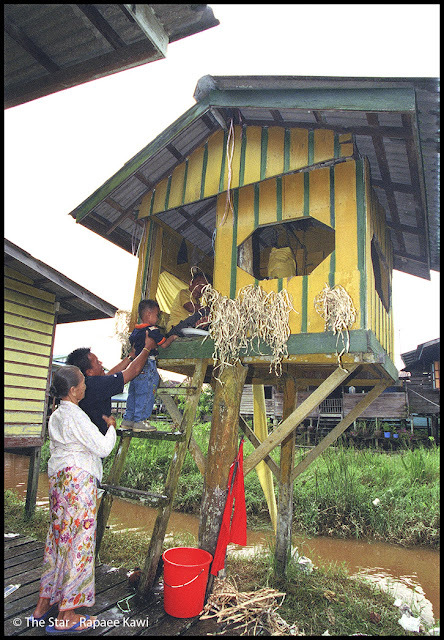 A traditional Kayan wedding in Long Liko, a village in the upper readies of the Balui River, a tributary of the Rejang. Bride and groom are both seated on gongs. The Kayan people, a sub-group under the Orang Ulu category, are found mainly in the middle Baram. Upper Rejang and the lower Tubau river systems in Sarawak. 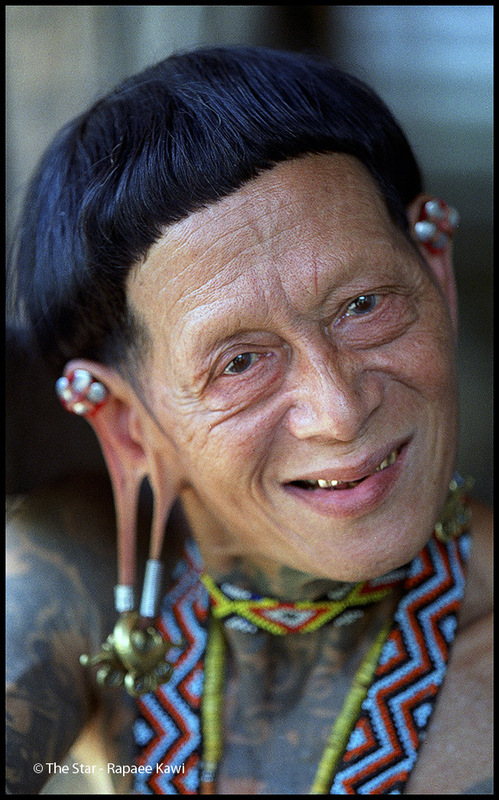 Kayan oral traditions trace the history of the Kayan people only as far as the Apo Kayan, Kalimantan, Indonesia. Kayan weddings are occasions for grand celebrations, particularly for those who can afford it. 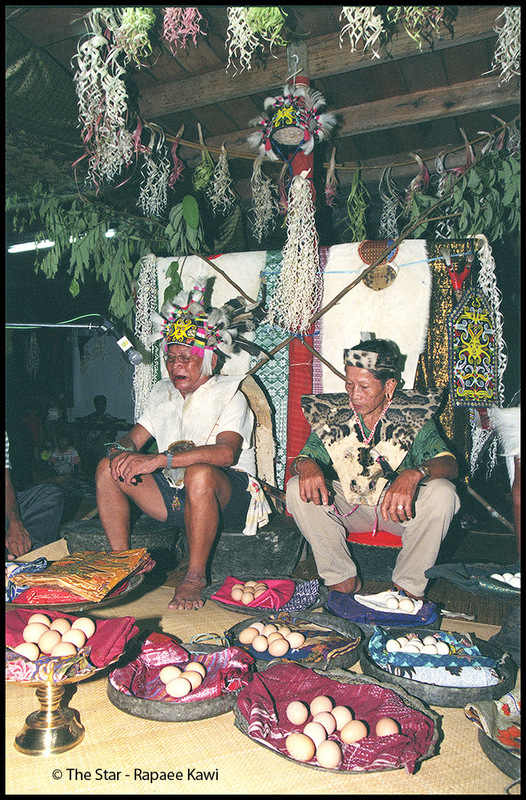 Two ritual specialists officiate during a Bungan religious ceremony. Bungan is a syncretic religion which incorporates elements of both Christianity and traditional Kayan belief. 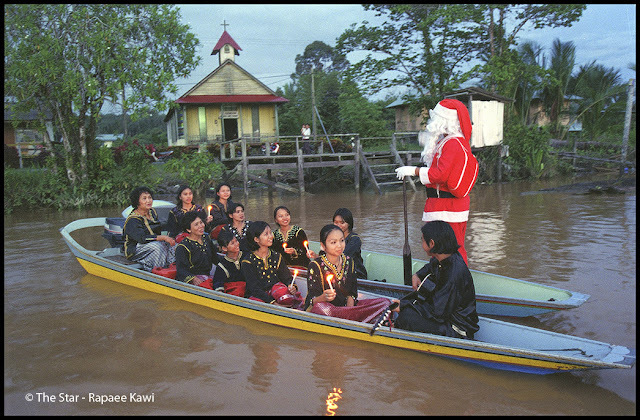 Founded in the late 1940s, it emerged in the Apo Kayan, Kalimantan, as a consequence of contact between two cultures: western Christianity and Borneo paganism. To free themselves from taboos associated with their old religion, many Kayans have embraced either Islam or Christianity over the last few decades. Other became followers of Bungan. In olden times,the Lundayeh bridegroom had to prepare stacks of firewood which would be used by the bride's family to cook for the wedding festivities. The practice is maintained even though most households now have kitchens with modern equipment. 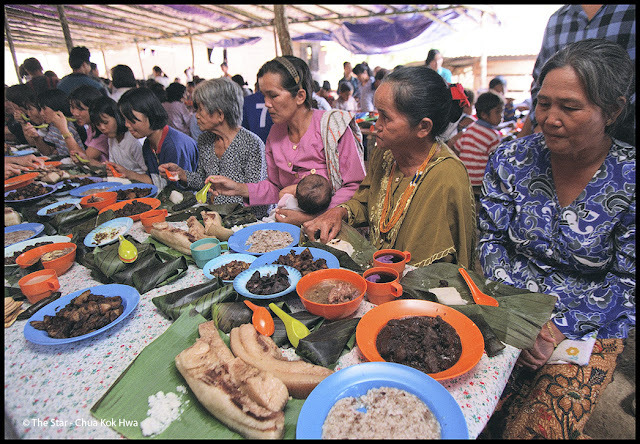 A Lundayeh wedding feast in Long Pasia, Sabah. 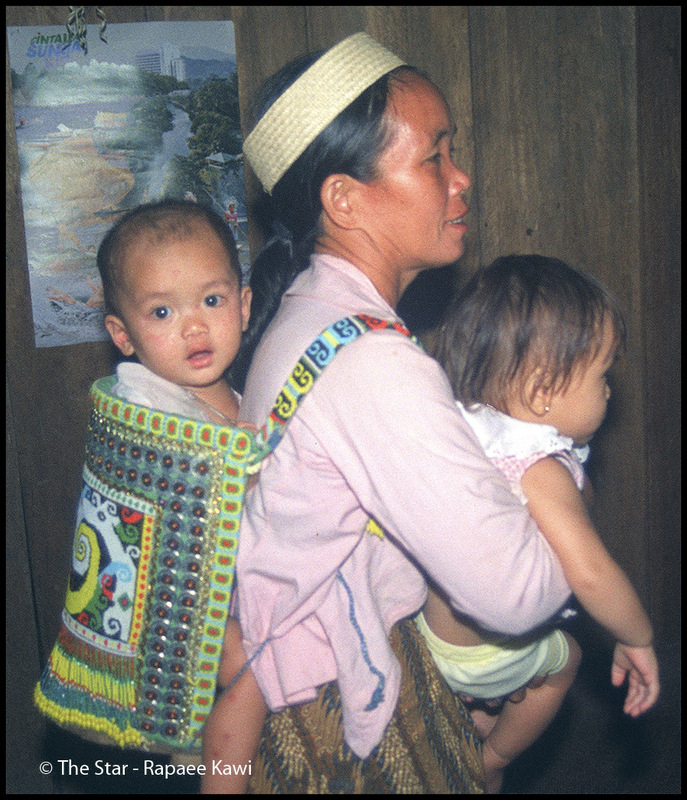 The Lundayehs are an indigenous ethnic group who are found in the interior highlands of Borneo Island. 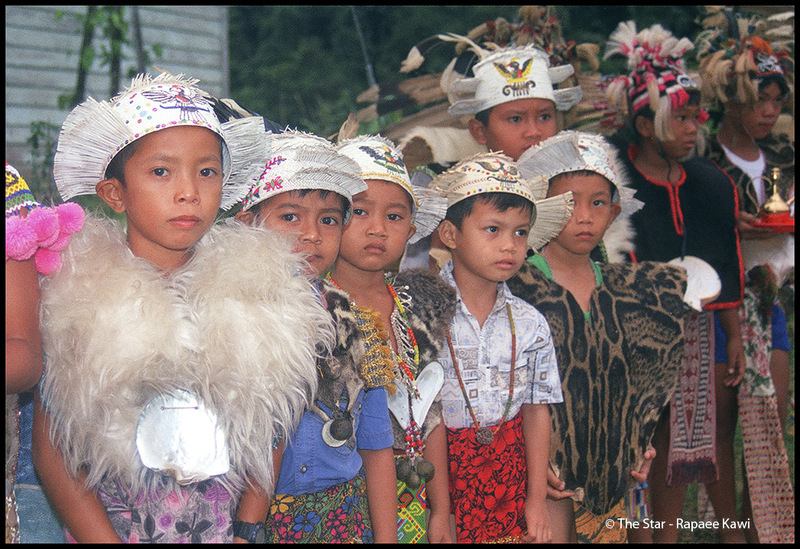 In Sabah, they live mainly in villages in the Sipitang and Tenom districts. Literally meaning people of the interior, Lundayeh is a self-referrent term for people who speak a variant of Lundayeh,a language which predates those of other Bornean stocks. Majority of the Lundayehs are Christians, for those living in their customary homeland, agriculture is the main occupation. Others who have moved to towns work as government servants and in the private sector. 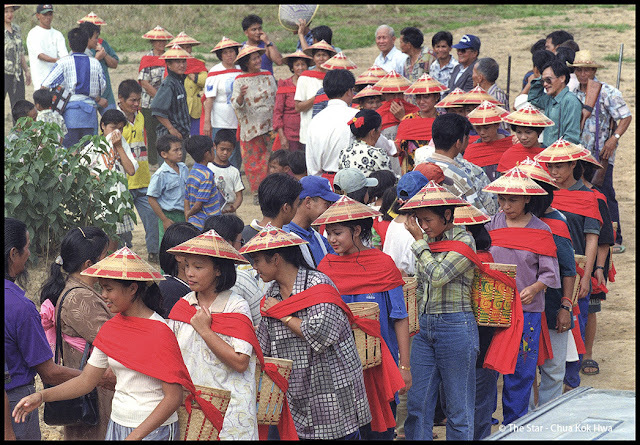 A Lundayeh bridal procession on its way to offer wedding gifts to the groom. In Lundayeh weddings, the exchange of gifts between bride and groom is a very elaborate and expensive affair. In the past, gift would include between10 and 20 buffaloes, one or two treasured heirloom jars and slaves. Nowadays, about 40 tekiding (native baskets) filled with household goods, and cash are the norm. The Punan Vuhang in Long Lidom are among the least known ethnic groups in Sarawak. 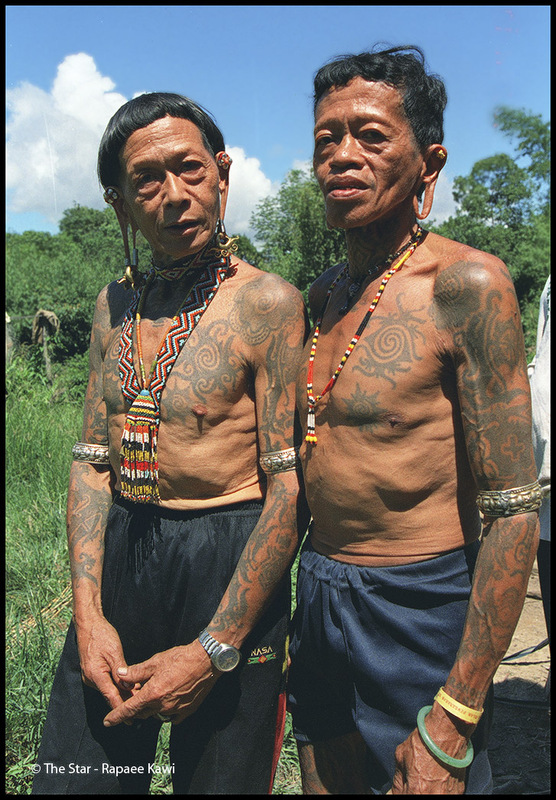 Despite the trappings of modern civilisation, these two men who live in a remote kampung near the Iran mountain in Central Borneo still sport the traditional forms of body adornment - tattoos and elongated earlobes. unfashionable with the younger generation. Traveling by boat is the best means of getting around between Punan Vuhang settlements. Dressed in their traditional finery, the ladies are attending a cultural festival. A man of means. Personal adornment such as bronze earrings, gold-capped teeth and beaded necklaces reflect the wealth of this Punan Vuhang man. Two dancers attired in costumes of the Cocos. When their tiny island homeland in the Indian Ocean was threatened by overpopulation, group of Cocos islanders were offered new homes in other British colonies. About 200 families agreed to migrate to Sabah and settled in the East coast mainly in Lahad Datu, Tawau and Kunak. 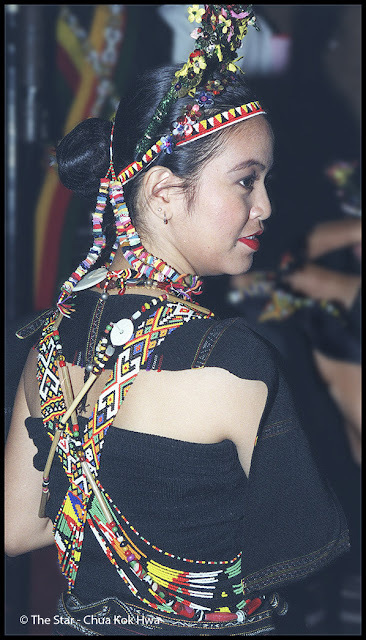 Like other communities in Malaysia, the Cocos people have also added their own unique cultural styles such as their dances - the densa and lenggok - to the Malaysian mainstream. In the few longhouses that remain in Sabah's Rangus heartland, the shared veranda is the meeting point where the inhabitants come to exchange gossip, work on their handicrafts or just while away the hours before night sets in. 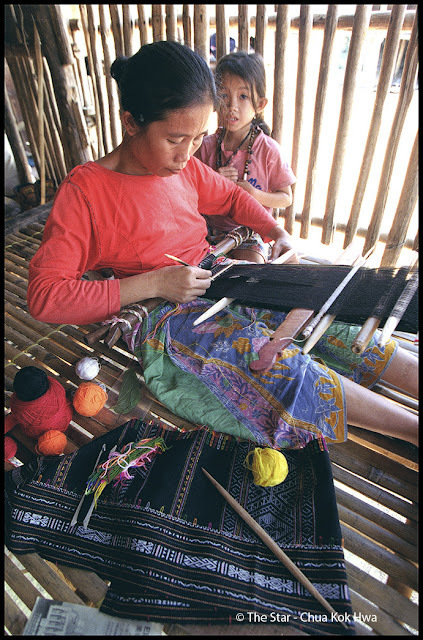 A deft hand with the traditional loom ensures a good income for this Rungus lady who lives in Matunggung, Sabah. Most Rungus weavers spin their own thread from home-grown cotton. 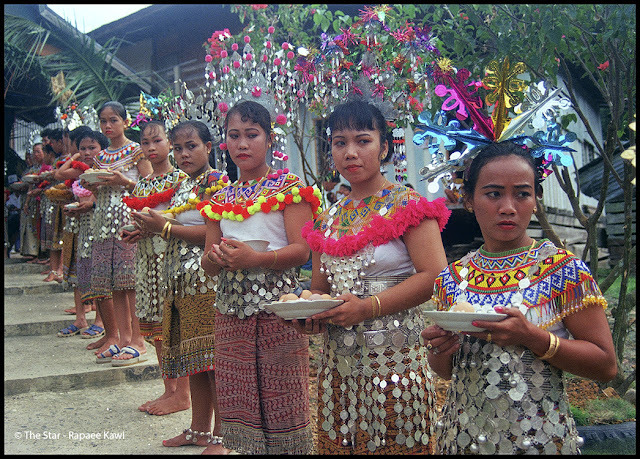 A sub-group of the Kadazandusun, the Rungus mainly inhabit the Crocker Range foothills in the Matunggung sub-district near Kudat and the Bengkoka peninsula. Most are farmers who cultivate a mix of cash and subsistence crops such as wet and hill padi, ginger,groundnuts, vegetables, palm oil and coconuts. While the more educated ones have found employment with the government and private sectors, others have taken to learning old community skills like wearing and making handicrafts. They used to live in longhouses (called binatang in the native language) of bamboo and attap construction. These forms of dwellings, however, are now no longer popular and the few that are in existence nowadays are used as tourist attraction. A dancer with a cultural troup dressed up in a modified version of the Rungus traditional costume. The actual costume comprises a black, knee length, cotton sarong which is tied across the chest. It is normally accessorised with coils of brass wire around the arms and legs, and beaded necklaces and belts. A sandayon (shawl) placed on the shoulder completes the outfit. The costumes are worn during special occasions such as weddings and the celebration of harvest festival which involves much merry-making and the performance of the Rungus traditional dance, the Mongigol. 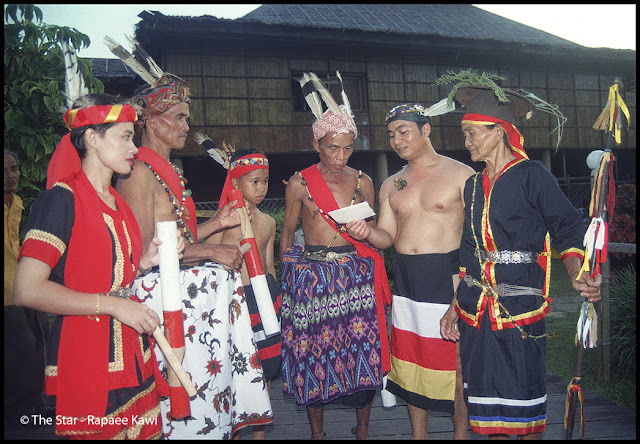 Members of the Bidayuh community in Kampung Benuk, Kuching, dress up in traditional gear to welcome a VIP visitor. 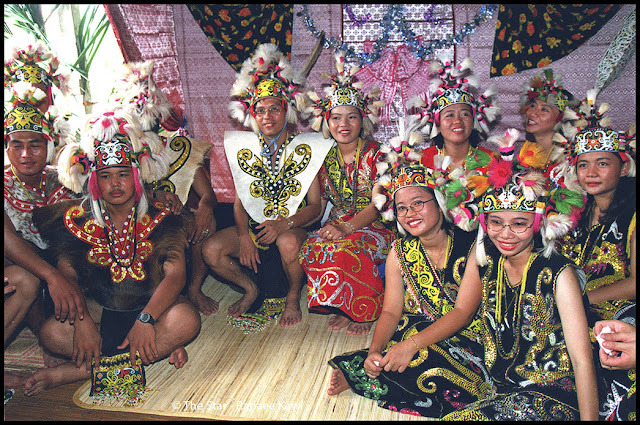 The Bidayuhs, the third largest ethnic group in Sarawak, live mainly in the hinterland of the Kuching and Samarahan Division. 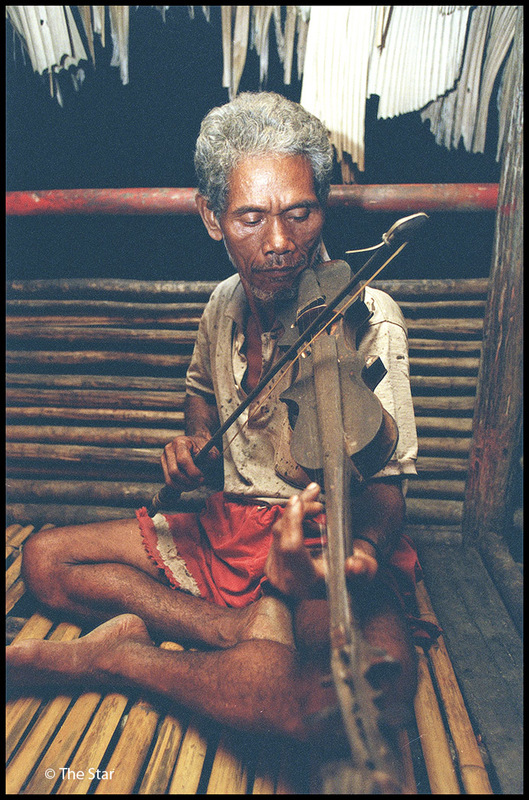 Also known as Land Dayaks, the Bidayuhs are believed to be among the earliest of Borneo's inhabitant. Many in the community are now professionals and intellectuals who work for the government and in the private sector. However, farming, especially planting cash crops like pepper, cocoa and wet padi, remains on important economic activity for the Bidayuhs living in rural areas. be popular especially in the more remote kampungs. Feast in an Iban longhouse. 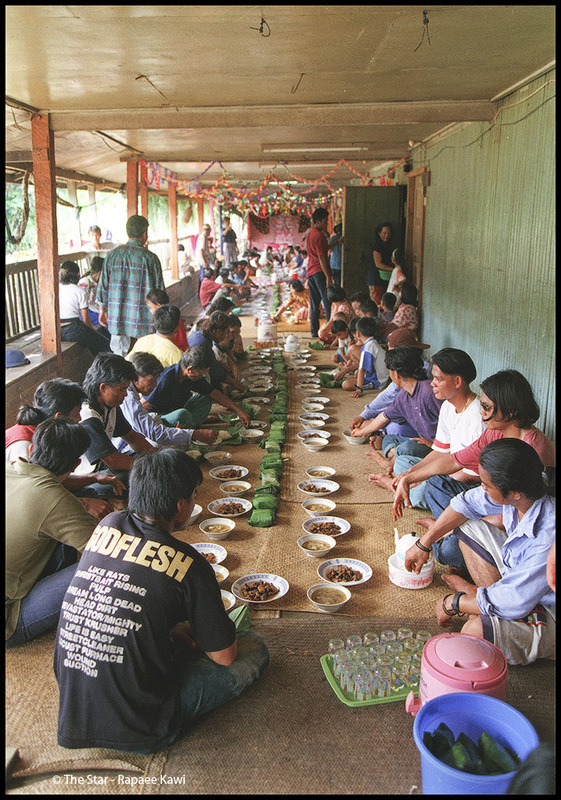 The veranda (ruai) of the longhouse is the main venue for large community meetings and celebrations. headgear from nipah leaves similar to the one she is wearing. The headgear is usually worn during the Mah Meri New Year's Day festivities. The Mah Meris are a sub-group of the Senoi tribe and are well-known for their wooden masks and other handicrafts. With nothing much to do at night, the ]akuns of Tanjung Keruing village in Cini, Pahang, usually gather around oil lamps to chat and listen to traditional music played by the menfolk. Here, a villager entertains his family and friends with a violin which he made himself. Easter is an important religious celebration among the largely Catholic Portuguese. On Good Friday, they flock to the church to participate in the veneration of the Cross to remember Christ's death. Candles are lit in church during Easter to mark the triumph of Christ's resurrection. 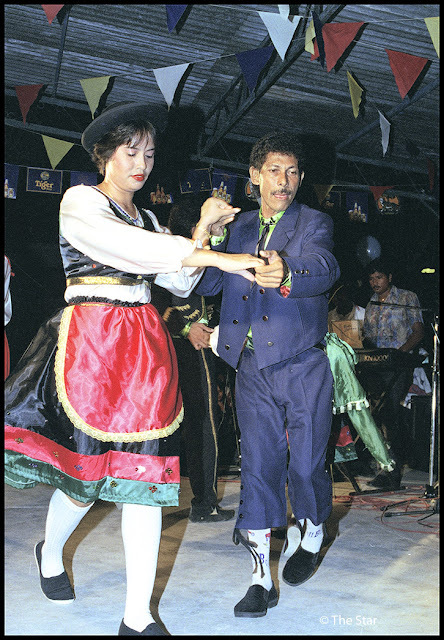 The dances of the Malaysian Portuguese are usually a swirling flash of colour as ladies dressed in colourful boleros, flared skirts and aprons (saia), and men in boleros, sashes, white shirts and the traditional hats (carapusas) prance energetically to a variety of ZT (CampUSaS) pmiUX ener^y to a variety of stirring Portuguese rhythms. 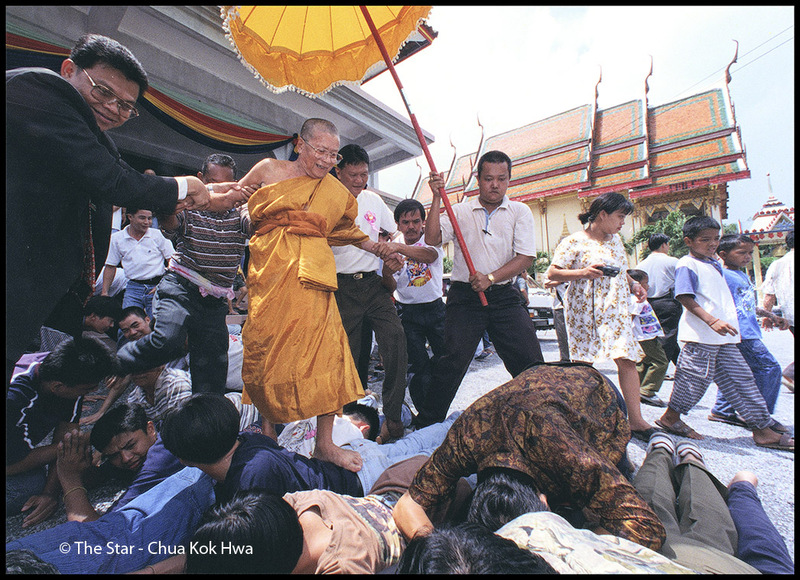 The Malaysian Thai community honour its chief monk during his birthday. As part of this annual celebration, the chief monk walks on a human bridge that stretches from the village wat to an altar which has been built especially for the occasion. 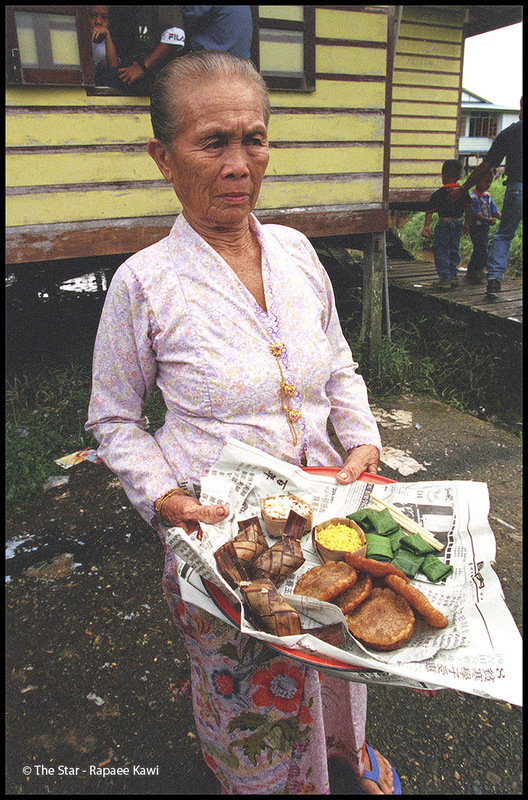 A Melanau woman in Kampung Medong carries a tray of food to offer to the guardian spirit oft the beliseng during a kaul (native word which means gathering). Kampung Medong is just one of the many villages inhabited by the Melanau people who make up seven per cent of the population of Sarawak. Living mainly along the coast from Kuala Rejang to Miri, they are engaged in a wide range of economic activities including sago processing, fishing, logging civil service, business and politics. The lifestyle of the Melanaus is basically determined by their religious beliefs. There is an equal number of Christians and Muslims and a sprinkling of those who continued with their animistic beliefs. New motifs on their traditional garb, for example the State Crest on the hats usually worn by the Ibans, reflects the dynamism of Sarawak's people. Devotees place offerings in the structure which holds the beliseng, an assortment of charms and amulets believed to have spiritual power. Performed during kaul beliseng, this animistic ritual has seen little change since its inception more than 200 years ago. A regatta normally marks the end of a kaul. Moving in a convoy, the boats which are decorated with bamboo streamers and colourful buntings travel upriver along the village and then back again. 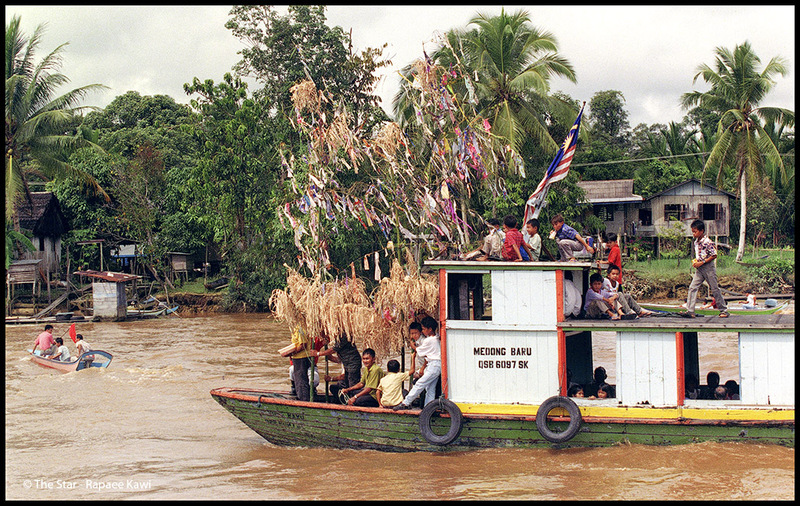 The lead boat carries the seraheng, a basket filled with food offerings. Christmas is celebrated with relish by Christian Melanaus. As their kampung is by the river, the carollers usually go from house to house by boat. 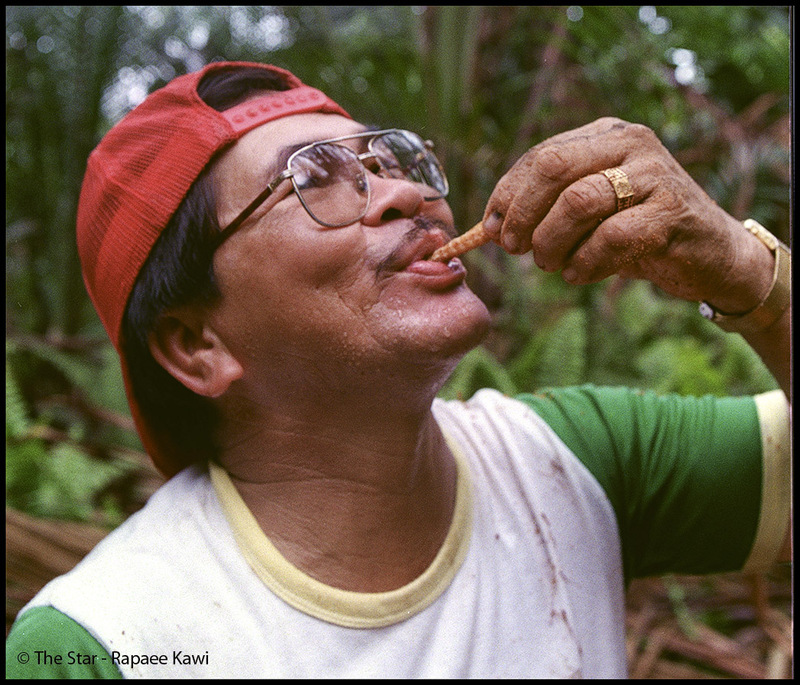 A Melanau enjoys a traditional delicacy, siet, (sago worms). A Kenyah mother and her children. The Kenyahs are one of Sarawak's minor ethnic groups and are categorised together with other minority indigenous groups such as the Kayans, Kelabits, Lunbawangs, and Penans. The Kenyahs are settled mainly along the lower and upper reaches of the Baram River in the Miri Division and Balui River in Kapit Division. To date, large groups of Kenyahs still live in longhouses which are normally sited more or less parallel to a river. The Kenyahs practise a number of decorative arts such as woodcarving, beadwork (as seen in the beaded baby-carrier) and painting wall murals. Rich cultural mix in Sarawak, Land of the Hornbills. Festivals are occasions for Sarawakians to put on their traditional costumes. This concluded the book "Soul Of Our Nation".